Despite high hopes and lots of hype, BrÃ¼tal Legend and DJ Hero, two of October's most anticipated releases, failed to make much of a splash on the sales charts. There haven't been many videogame advertising campaigns as pervasive or, one would think, as expensive as the one for BrÃ¼tal Legend. 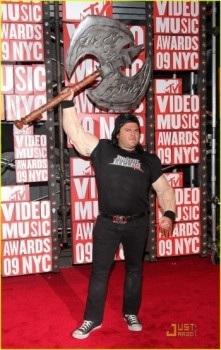 Ads for the game seemed to pop up everywhere on television and online, while Jack Black himself made numerous promotional appearances on shows ranging from Jimmy Fallon to the MTV Video Awards, usually at least partially in character. In spite of all that, however, and the high hopes of Tim Schafer fans and middle-aged metalhead gamers everywhere, BrÃ¼tal Legend didn't exactly come roaring out of the gates in October. It failed to break into the NPD Group's top ten sales chart, putting out a combined 215,000 units on the Xbox 360 and PlayStation 3, a respectable but hardly Earth-shaking number. It's still considerably better than what Activision racked up with DJ Hero, however. The latest addition to the Hero franchise, including both the regular and Renegade Edition releases, managed combined sales of only 122,300 units on the Xbox 360, PlayStation 3, Wii and PS2. To be fair, DJ Hero was only released on October 27, but sales still fell well short of analysts expectations. The slow start isn't a death knell for either title; with the holiday season upon us, sales for both could experience a significant jump over the next 60 days. Activision also made a point last month of predicting that DJ Hero would be a "slow starter" that would build an audience over time and eventually become an important part of Activision's lineup. Still, I can't help but be a little disappointed about BrÃ¼tal Legend; as someone who appreciates both Tim Schafer's creativity and violently thrashing my head around in time with K.K. Downing's melodious strumming, I was really hoping for bigger and better things.